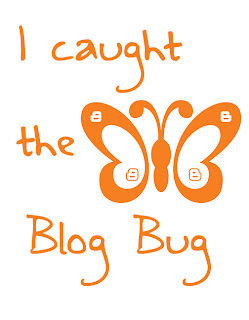 Everything But The Kitchen Sink: I Got Bitten By The Blog Bug! Thank you so much to myriam from myrberry for nominating me!! I love doing these posts coz you get to see new blogs from different people and I always find something really interesting to read!! If you are given the blog bug award, you must answer the questions that follow and the title of your post should be "I Got Bitten By The Blog Bug". You must give the link of where you originally got this award and you can tag as many bloggers as you want. Link their pages on the post and also inform them through comments on their blog. Ooohh, right I started blogging in March this year. My friend from NakedBlueberry started her blog a while ago so I thought it would be really cool to start my own! I like the fact that I can blabber on about anything and everything and not worry about what anyone thinks :) Plus reading other people's blogs gives me great ideas! 2. What do you like to blog about and why do you like it? I wanted a name that would mean that I can blog about anything so I didn't have to be so specific in what I write about! I had to google 'good blog names' and search for a name until I found this one! This may sound a bit cheesy, but my inspiration is all of your blogs!! I'm always getting new ideas and tips. I can see why people have such great blogs so I 'borrow' their ideas! Also I enjoy sharing all my stuff with you guys! Thank you so much for sticking around and bearing with me!! I know my blog can be a bit poo sometimes but I'll keep improving on it all and make it better!! I really appreciate all my followers and comments, so thank you all so much from the support! That's all of it done I think! !